I encourage you to visit this Mentionmap site and put your twitter name in, then see who you're most connected to. Try @tutormentorteam and you'll see how we're connecting with. This blog shows how to use the Mentionmap site. 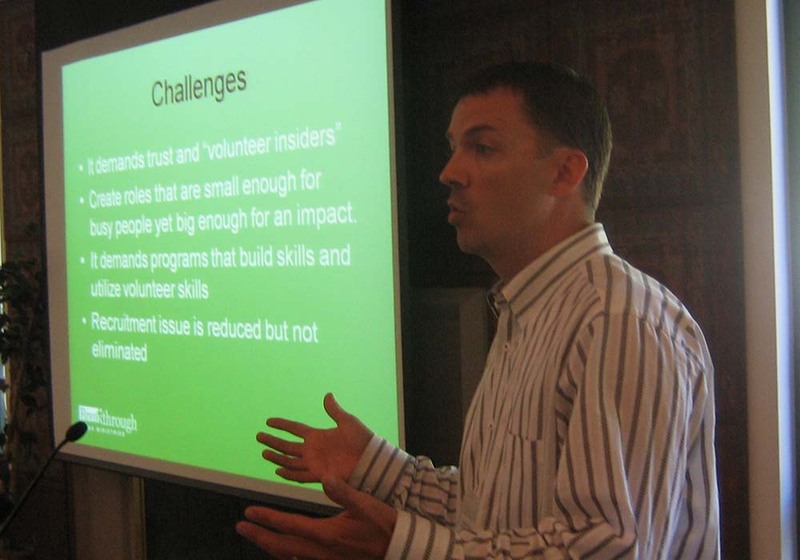 While the National Conference on Volunteering is taking place this week in Chicago, most people who are involved in volunteer-based organizations, are in their local programs trying to find ways to keep their programs in business, and improve the impact of what they do. 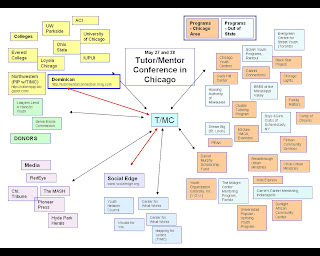 This video is from the May 27 and 28 Tutor/Mentor Leadership and Networking Conference, held in Chicago. More than 140 people attended, and shared ideas. On the conference web site you can see some of the presentations, photos, and an attendee list that enables people who attended, or did not attend, to connect with each other. Below is a map, showing the range of organizations that were at the conference. All of these are groups with a common goal of helping connect youth in high poverty areas with extra adults, and extra learning, primarily in non-school hours and non-school locations. Imagine if network maps like this were being created at big conferences like the one in New York City, showing how people are connected to each other, and how they might stay connected in the weeks and months between now and the next conference a year from now. We're planning for fall 2010 Tutor/Mentor Connection activities, including a Tutor/Mentor Jam Concert to be held August 29th in Chicago, and another conference in November. For us to make these a success, we need a network of donors, sponsors and volunteers to step forward to help. We can shape the future in the image we want it to be, but not without the full support of resource providers, volunteers, students, peers and many other people. This week leaders from business, philanthropy, media and the non-profit sector are gathering in New York City to share ideas on volunteering and community service. I attended the conference twice in the past, so I'd like to share some thoughts while this event is gaining national attention. First, if we want to help more kids from high poverty and minority neighborhoods succeed in school and move to jobs and careers, we need to connect them with volunteers who can mentor different types of jobs and careers, because they are already holding these jobs. Second, we need to visualize this as a long-term strategy, that will take the involvement of many people, organizations, and leaders, over many years. Thus, while leaders are talking about volunteering and service, we need them to think of the infrastructure of a non profit, that supports the involvement of volunteers as tutors/mentors, leaders, tech support, innovators, accountants, and every other role that any business needs to be successful. How do we make this happen, not just in a few places, but in all of the high poverty places in every big city, where the high school drop out rates, and the crime/violence rates, are the highest? 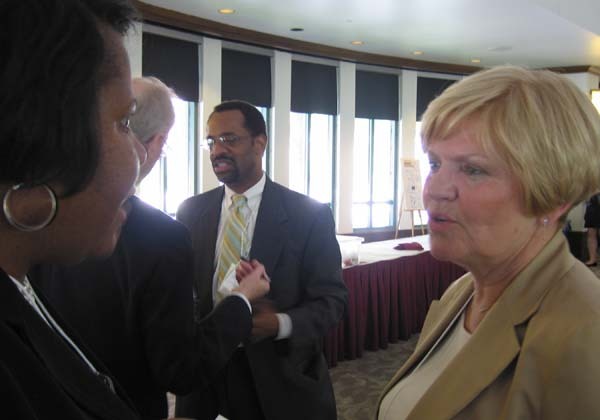 After I attended the June 2008 national conference, I wrote some articles that share my thinking. Note. Some of the links in these articles may be broken due to changing web sites. All of the essays that we've written can be found in the Tutor/Mentor Institute library. 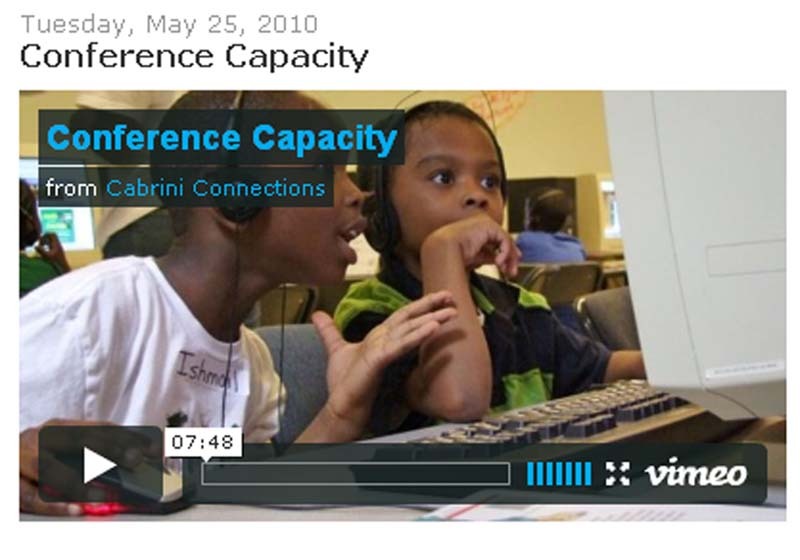 If this year's conference results in a surge of reinforcements to help volunteer-based tutor/mentor programs strengthen their infrastructure, pay the rent, and keep staff employed, we'll start the 2010-11 school year with stronger organizations working to keep kids and volunteers connected for another school year. If we don't ramp up the reinforcements, it will be like saying to your kids, "I gave you birth and have raised you to this level. Now you need to go out and find new parents because I've run out of money to keep helping you grow up." Chris Bosh, Chris Zorich. What in Common? I heard Chris Bosh, NBA basketball star, talking on the radio the other day about a youth charity he leads. He's shopping his skills to many cities, and will have a new contract at $16.5 million per year by the end of July. Any city that gets his services, might also get his support for youth programs. I also saw an article in the Chicago Tribune about how Chris Zorch, a former football star at Notre Dame, and a "not so great" star with the Chicago Bears, started a youth charity, but that it's now "in disarray" with almost $850,000 in un-accounted donations that have not been distributed to help needed people, as was promised. 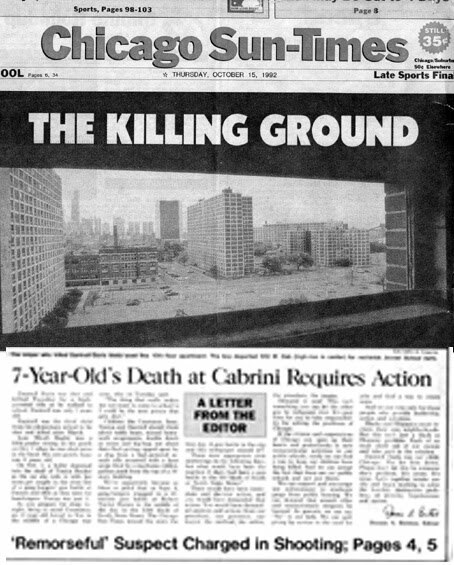 Zorich never made as much as Bosh, but $850,000 would do a lot to help Cabrini Connections, or other tutor/mentor programs, overcome the loss of donors caused by this depression. The Tribune article goes on to talk about the charities of many athletes. Lots of good intentions, but not a lot of business experience. Too bad. That star power could do a lot to help us help kids. I've written articles in the past showing the potential of athletes using their start power to draw more consistent attention to all of the tutor/mentor programs in Chicago than those programs can do for themselves. I encourage you to read these. El Da'Sheon Nix, who leads our Cabrini Connections program, and is a former football player at Northwestern, also writes a series of articles using sports concepts to show how tutor/mentor programs work like sports teams, and need fans in the stands and boosters, to help them be great programs. I tried to find the Chris Bosh Foundation with a Google search, and could not find it. I started "following" him on Twitter, to see if I can get his attention. If he comes to Chicago, he could be a great addition to the Tutor/Mentor Connection team. If he goes to another big city, he could still use the ideas on the Tutor/Mentor Institute site to add some new plays to his game plan. If you're in high school, college, or have been lucky enough to make it to the pros, I hope you'll take a look at these ideas. The image below shows the range of different organizations who connected to each other at the May 2010 Tutor/Mentor Leadership and Networking Conference held at Loyola. This was the 16th year we've offered a May conference. It's only possible because so many people volunteer to be speakers and because we've been able to scrape together a few dollars to organize these. One participant was Charles Cameron, who hosts discussions on the Social Edge forum. This week, Charles has taken the discussion from the Conference in Chicago, back to the Social Edge web site, where it is connecting our network with people from throughout the world who might use our ideas to help kids in their own community, or who might add their time, talent, or dollars, to help us provide these services in Chicago. Join in and see how we're connecting networks. 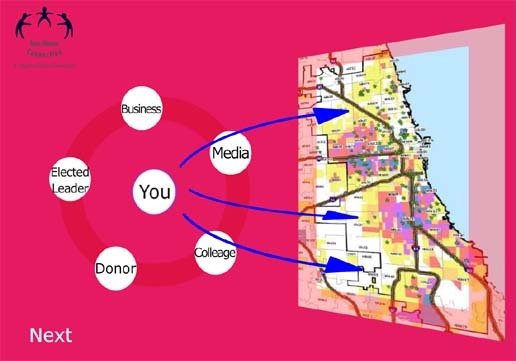 Then visit the Social Network Analysis group on our Ning site, and learn how we're trying to map network growth, showing the role of an intermediary like T/MC in helping connect people from around the city, and the world, with each other. As you browse this group, you can also see how we're trying to show how a tutor/mentor program expands the network for youth, and adults. This article says "it's who you know, not just what you know". We agree, and we hope that investors will also agree, and provide the dollars that each tutor/mentor program needs to build and sustain this type of network surrounding inner city kids. 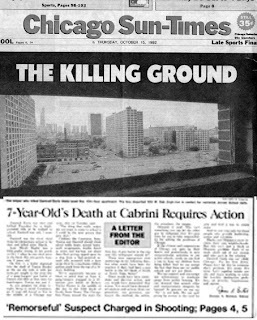 In October 1992, when we started Cabrini Connections, the front page of the Chicago SunTimes demanded action, and responsibility, from all citizens of Chicago. We've responded to that call for 17 years with the services offered by Cabrini Connections and the Tutor/Mentor Connection. The economy is causing past donors to cut funding, so we need help from many volunteers and friends to find new donors and sponsors to keep us in the business of mentoring for the coming year. Please look for ways you can encourage people in your network to become donors, sponsors and/or benefactors. Don't "hope" that someone else will take this role. Visit http://cabrinitmcfundraising.blogspot.com to see different ways that you, your friends, or your company, can become involved. $41 trillion in wealth transfer. Getting a Share. I've been leading a non profit for 20 years. I'm tired of constantly searching for scarce dollars. I want to find ways to change the way we're funded. So, when I read about $41 trillion in wealth being transferred over the next half century, with at least $6 trillion being allocated to charity, I want to find a way that my organization, and other tutor/mentor programs, get a fair share. I've learned to tell the tutor/mentor story every day, in many ways, so that we find the donors we need to keep Cabrini Connections, Tutor/Mentor Connections in business. However, this is not something others are used to doing. In many organizations, and businesses, the sales team, who generates revenue, is separated from the operations team, who spends the money. In a volunteer-based tutor/mentor program, the people managing the volunteers are not always the people responsible for raising the money. However, I believe it is absolutely essential that these roles be blended. Why? I've just read a chapter of a book titled Death and Dollars. The chapter I read it titled How do People Leave Bequests: Family or Philanthropic Organization? It was written by Paul G. Schervish and John J. Havens. The first part of this chapter suggests that "self-identification with others in their needs (rather than selflessness) motivates transfers to individuals and to philanthropic organizations and leads givers to derive satisfaction from those needs"
Furthermore, "identification with others develops and is applied primarily through networks of association that bring donors into contact with potential recipients". Thus, the volunteer who becomes part of a tutor/mentor program, is beginning to form an association with that organization. If that relationship is sustained, and nurtured, and retained over many years, the organization is building a network of future benefactors. This graphic is the first screen of an animated presentation done for the Tutor/Mentor Connection, by Li Li, an intern from the University of Michigan. 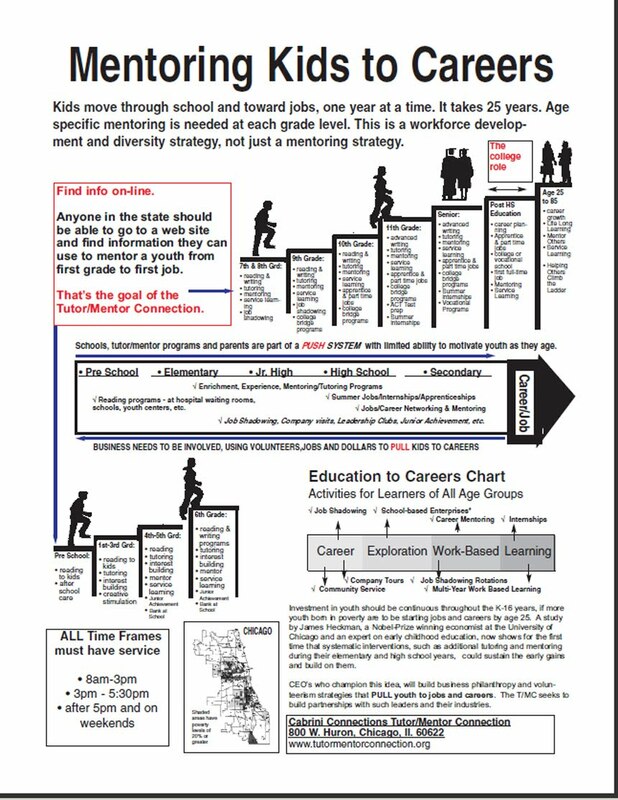 This illustrates that the support given to volunteers, so they are effective, satisfied, tutors/mentors, leads to their growth as an advocate for the youth, and the organization, if sustained for many years. Thus, to anyone leading a tutor/mentor program, the strategies you use to recruit and train volunteers, can also be strategies to capture a share of this future wealth transfer, ensuring that you have the operating dollars essential for supporting the involvement of other volunteers in the future. While this is a strategy at Cabrini Connections, we only have 100 volunteers involved each year. There are at least 100 other tutor/mentor programs in the Chicago region that have between 50 and 100 or more volunteers each. If all of those programs were thinking the same way, and linking to each other, we would be coaching a pool of 5000 to 10,000 volunteers each year. If this were happening in 100 cities across the country, we would be mentoring the growth of over 1 million volunteers each year. Why is this so important? We cannot operate effective, volunteer-based tutor/mentor programs with the small pools of inconsistent funding that are available to us from the current donor population and/or from public dollars. Inconsistent revenue means that we cannot attract and keep high-quality leaders, who are the glue that keeps kids and volunteers involved. 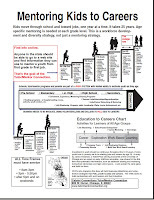 We cannot do the data management, learning and network-building that keeps us connected to our students and volunteers beyond the years they are active in a program. We cannot be connected to our peers the way we need to be. And this means that we will not have the impact on youth aspirations and attitudes and learning habits, that is so essential to feed the 21st century economy with skilled, knowledge-centered, workers and informed citizens. I hope that you'll take time to read these articles, and look at the previous blog articles I've posted related to leadership, network building, collaboration, etc. 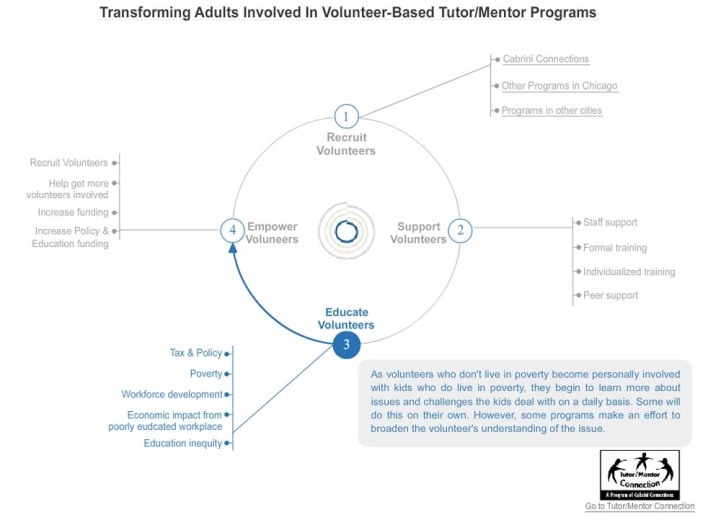 and think of ways your actions, or your organization, can combine with actions of many other people, so volunteer-based tutor/mentor programs earn a share of this $41 trillion dollar wealth transfer. Thanks to Phil Jackson and The Black Star Project for sharing this story via their email newsletter. This study, By Deborah L. Shelton, Chicago Tribune reporter, "says academic performance suffers whether they witness the nearby violence or not" Read the full article. 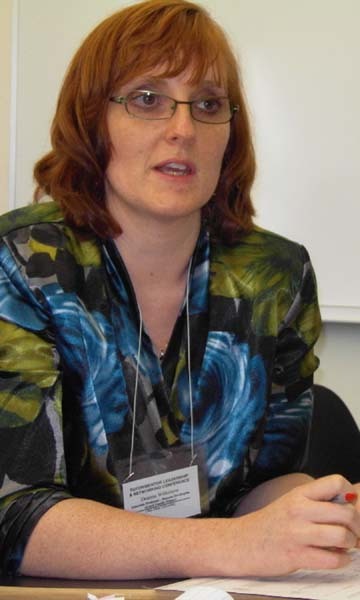 One of the speakers at the May 27 and 28 conference was Deanna Wilkerson, a professor at Ohio State University, and an expert on urban violence and its impact on youth. You can find her presentation, along with those of other speakers on the conference web site. You can connect directly with her in the Tutor/Mentor Connection on-line forum. Volunteers, in well-organized tutoring/mentoring programs, can provide a range of mentoring, coaching, tutoring and social/emotional support to help youth overcome the impact of violence in their lives, if the programs are available, and if the programs have the consistent funding to be as strong as they need to be, and to stay that way for many years. So, if you want to do something to help kids living in inner city war zones, pick one of the programs listed on this list of Chicago Program web sites, or Cabrini Connections, and send a donation today. If you want to know what a "well organized program looks like" browse the web sites we point to, and compare them to each other. Some do a great job of showing what they do. 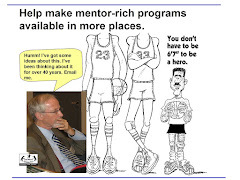 Others make it difficult for you to know they have a mentoring program. Look at when they were formed. The longer they've been hosting a tutor/mentor program (not how long the agency has been in business), the more likely that the program is well organized (or it would not have lasted so long!). Some use graphics to show their strategy, such as this page on the BUILD web site and this page on the Breakthrough Urban Ministries site. 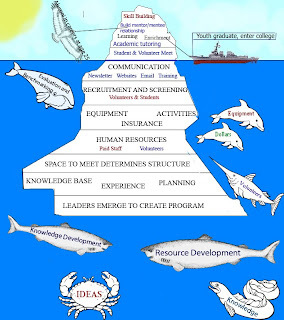 Cabrini Connections shows its Success Strategy on its home page, and shows many of the other ideas we apply, on the Tutor/Mentor Institute site. Don't penalize programs that don't look as good as other programs. Use the ideas from all of the web sites we point to, to help each program become a world-class organization. They all need to be great, because they are all serving different kids in different parts of the city. You can see this distribution using the interactive tutor/mentor program locator. This information was provided by the Tutor/Mentor Connection, a part of the Cabrini Connections non-profit organization. 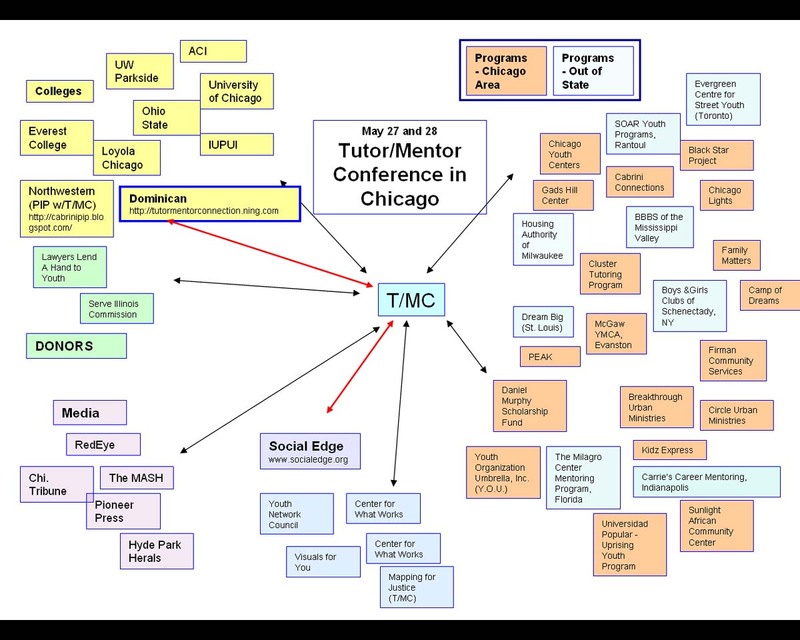 There are hundreds of questions that could be asked about the tutor/mentor programs in Chicago, based on the database we maintain, but we barely have enough money to keep the database current and share the information on web sites. 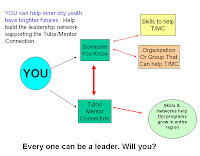 If you want to help tutor/mentor programs grow in all poverty neighborhoods, and where violence is influencing student aspirations and learning, then provide dollars to the Tutor/Mentor Connection, as well as to individual programs. Tangela Smith Marlow attended Cabrini Connections from 1993 to 1997 when she finished high school. Since then she has finished college, become a mom, and holds a good job. She's now taking grad school courses. She is still connected to the Cabrini Connections network via Facebook and Linked In. She was a speaker at the June 10 year end dinner. Tangela is one of the co-sponsors of the Cabrini Connections Alumni Fund. Can you join her as a supporter of Cabrini Connections? Here's a video of the Cabrini Connections year end dinner, created by Minsang Lee, an intern from Korea and IIT who is volunteering with us. Enjoy it. "Thus is truly a divine organization"
Last night Cabrini Connections hosted it's annual year end dinner, with more than 200 students, parents, alumni, volunteers and leaders in attendance. We'll post photos and videos on the Cabrini Blog and other place over the coming week. However, I want to share a few quotes while they are fresh in my mind. One parent spoke for about 10 minutes, gushing with enthusiasm, and love, about the volunteer tutor/mentor who has worked with her daughter for six years. She said of the volunteer and Cabrini Connections, "they go the extra mile" and "This is truly a devin organization." She ended by presenting a dozen roses to the volunteer. Then one of our alumi, Tangela Smith Marlow, spoke. Tangela graduated in 1997 after being part of the program since it was founded in 1993. She has finished college, is a mom, has a good job, and now is in graduate school. She said "I am super mom!" She also said "This program was my foundation" and "when tutoring is over, that's not the end of it". There's much more. The video club showcase four short videos. The tech club showed the pilot of a video game they are creating. The art club showcased art they did this year. The writing club presented a story/poem that they created. These are all part of a Success Steps Strategy intended to help kids living in high poverty neighborhoods grow up to be healthy, contributing adults, who have a network of adults and friends who are still helping them many years past when they were active at Cabrini Connections. When it was my turn to speak I thanked everyone for the work they do to make Cabrini Connections great, and to bring out the greatness in each student, volunteer and leader. Then I quoted a frustration expressed by El Da'Sheon Nix, the leader of the Cabrini Connection part of this organization. "If we're doing such good work, why is it so difficult to find the money to pay for it?" We're not "fixing" broken kids. We're trying to help good kids overcome the challenges of living in high poverty neighborhoods of a huge city. If you think this is important, you should help us do this. Or you should help someone else do this in other neighborhoods where similar programs are needed. I challenged everyone to share the stories of last night's dinner, and of their experiences with Cabrini Connections, with friends, family, co-workers and anyone who might help with a donation, small or large. You can still make a dinner donation. You can donate to the alumni fund. Or, you can become a sponsor for the July 15 golf benefit. If you are a new donor, or if you increase your donation over 2009, your donation will be matched (up to $1,750) by a generous donor. Becoming Great. Learn from Others. In 1975 when I first began leading the volunteer-based tutor/mentor program at the Montgomery Ward headquarters in Chicago, an officer said to me "You don't know much about this. Why don't you find other programs in Chicago and invite them to lunch. See what you can learn from them." I've been doing this network-building and learning for the past 35 years. It's the reason I'm still in this work. It is advise I share with anyone else starting, or leading, a tutor/mentor program. 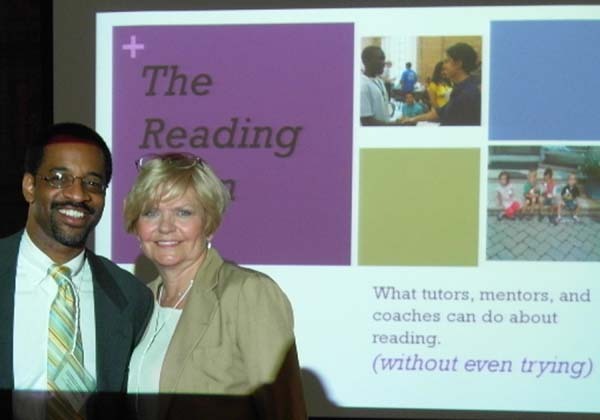 One of the keynote speakers of the last Tutor/Mentor Conference, was Catherine Gottfred, Founder, LEAP Learning Systems I've known her for almost 20 years, since she began her work with the Chicago Youth Center in Cabrini Green. Catherine talked about "Youth Brain Development and Literacy"
Michael Levesque, Executive Director, Leap Learning Systems, did a workshop titled "Race, Language, and the Achievement Gap in America". Here's the PDF of Michael's presentation. What's great to see at these conferences, is the networking of speakers and participants, after each workshop, and during the lunch session. You can find more pictures, more of the workshop presentation PDFs, and a list of attendees on the conference web site. This conference, and the Tutor/Mentor Connection, have been made possible since 1994 because the leaders of one small non profit have raised the money to cover the costs, while operating their own Cabrini Connections program. This has become more and more difficult with the deepening recession. We need your help. 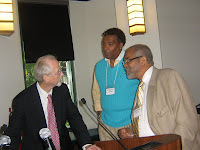 You can make donations to support the Tutor/Mentor Connection and the Conference at this link. And, you can become a sponsor of the conferences, at this link. 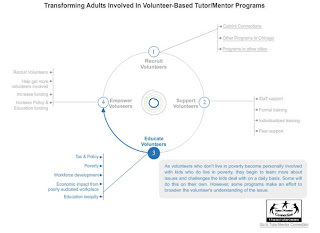 Please help us continue to do what we do to help hundreds of volunteer-based tutor/mentor programs learn from each other, so they can do more to help kids living in poverty. How many of you have read the Jim Collins book titled "Good to Great and the Social Sectors"? The key to constant improvement, is a commitment of leadership, and members of the organization to constantly look for ways to improve. I describe this in the Operating Philosophy, posted on the Tutor/Mentor Institute web site. 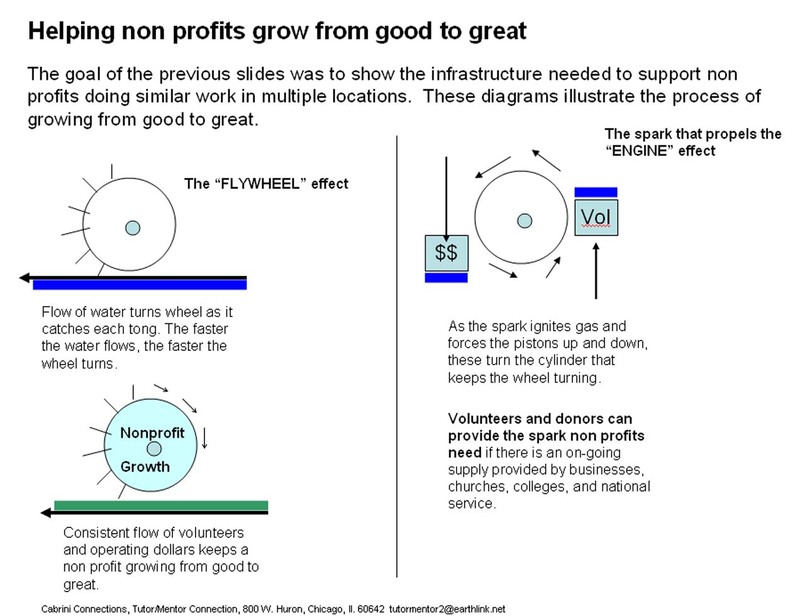 However, I'm convinced that the only way non profits can become great, and remain great for many years, is if they can develop consistent revenue streams that enable them to hire and retain talented people, and that give these people time during the work day for expanding their network and learning from others, reflecting, and innovating new ways to improve from year-to-year. Thus, I'm constantly working to teach our volunteers, Directors, friends, and leaders of other tutor/mentor programs, to take on roles where they become agents, and advocates, for tutor/mentor programs. The Major League Baseball draft is going on right now. The first round pick is represented by an agent named Scot Boras, who is known for negotiating multi-millions dollar contracts for the talent he represents. Each volunteer who wants to help Cabrini Connections and other tutor/mentor programs make a difference in the lives of kids needs to view him/herself as an "agent" working to build the best support possible for one, or many, tutor/mentor programs. With this type of help, we can be great, and we can stay great. That will result in more youth through school and into jobs and careers, which is the focus of this Forbes magazine article. 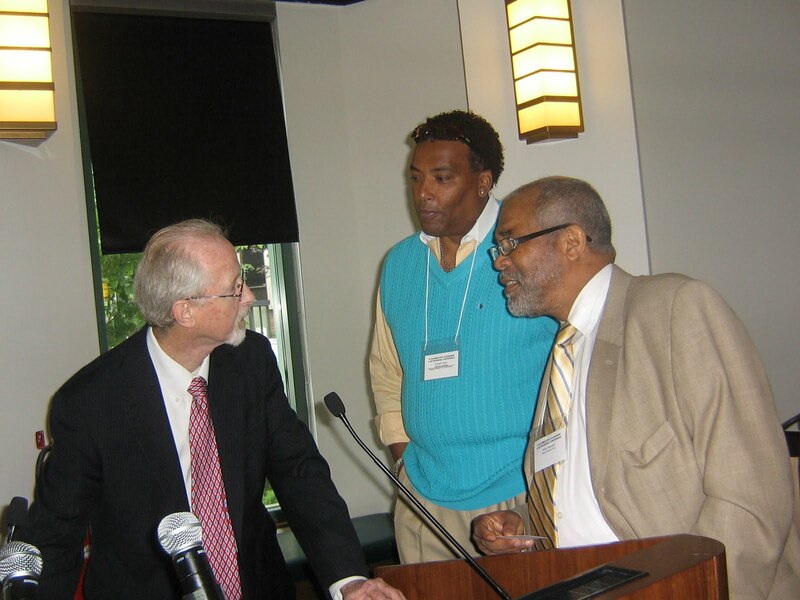 This is one photo taken during the May Tutor/Mentor Leadership and Networking Conference. See the album here. 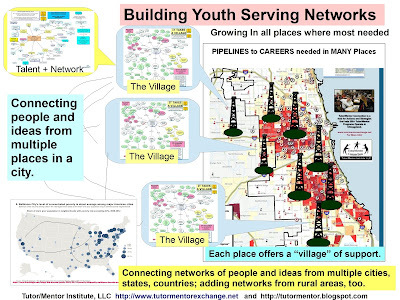 In this photo, Bill Curry, Chief Operations Officer, Breakthrough Urban Ministries, is describing The Breakthrough Network Model which suggests an innovative approach to growing mentoring relationships among a community of students and community of volunteers. In the coming two weeks I'll profile more of the speakers from the conference and point to their presentations and web sites. You can see the entire agenda here. By doing this I'm demonstrating a leadership role that thousands of people, who are not directly involved with any single tutor/mentor program, can take to help people become supporters of different programs, or to borrow ideas from one program to apply to many other places. This is a network-building role that Tutor/Mentor Connection has taken since being formed in 1993. When you point your friends and business partners to tutor/mentor programs, point them to intermediaries like the T/MC, too. In this economy we all need help finding donors and sponsors. As we remember the the WWII landing on Normandy on June 6, 1944, can you also make this a weekend when you make an extra effort to be a "hero" for Cabrini Connections? On June 10, Cabrini Connections will celebrate the end of its 17th full year. We will have 9 seniors graduating from high school. Seven are already accepted to college. We will have more than 60 7th to 11th graders who expect to participate in this program again next year. We need help from you and many other heroes to make this happen. This weekend, can you ask one or two people you meet to make a donation to support the continued operations of our army of youth and volunteers? Can you make a donation, a bequest, or be a sponsor? Use this form to send a donation. Read the blogs and see how your donations are being put to good use. Thank you! Please forward this request to others. This video was created by one of the Interns who have worked with the Tutor/Mentor Connection over the past few years. As programs are celebrating the end of this school year, they are looking for dollars to help them provide services in the coming school year. Make a donation. Be a sponsor. Make a bequest. This is a photo from a workshop hosted by Alex Cornwell, Director, Chicago Lights Tutoring and Summer Day at Fourth Presbyterian Church, and Erin McPartlin, Executive Director, Cabrini-Green Tutoring Program, Inc.
You can meet both in this video. I received an email from one conference attendee which said, "Hi Dan - I want to thank you and your organization for providing scholarships for me and my staff person. 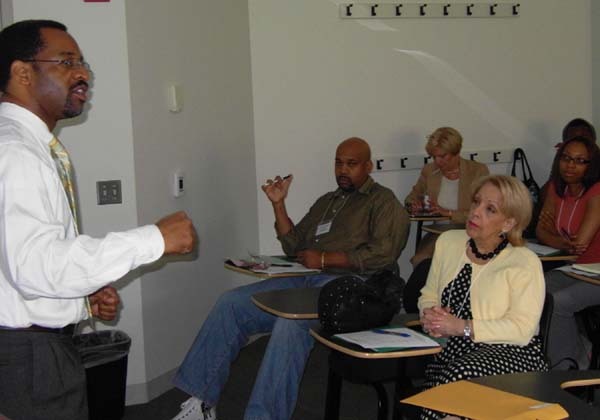 I found the workshops to be insightful and the keynote speakers knowledgeable. I wanted to speak with you on several occasions but every time I wanted to approach you someone else would get your attention." At every conference, I have a chance to meet and talk to just a few of the participants, and that's why we created the Attendee List and the Tutor/Mentor Connection on Ning. We want to have on-going discussions with every one of the 140 people who attended this conference, and the 3,000 or more who have attended conferences since we launched them in 1994. We also want to encourage this type of interaction between the people who come to the conference, and those who cannot come, so that we create a vibrant idea-sharing network of people who will work together to make sure we all have the tools and resources to keep kids and volunteers connected.